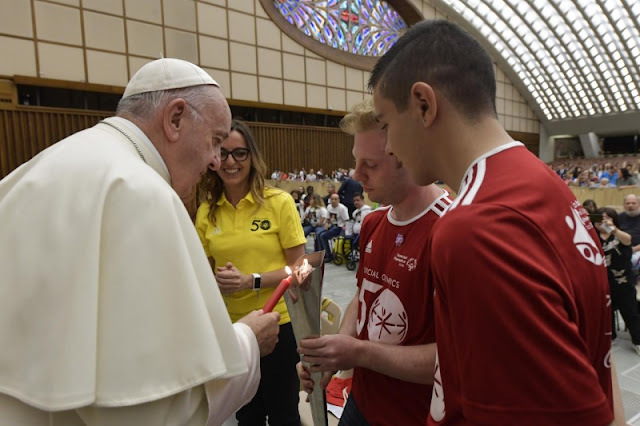 Catholic News World : Pope Francis to Special Olympics " The Lord reserves a special place in his heart for anyone with disabilities, and so does the Successor of St. Peter!" Pope Francis to Special Olympics " The Lord reserves a special place in his heart for anyone with disabilities, and so does the Successor of St. Peter!" I warmly welcome the "Deaf Catholic Youth Initiative of the Americas" group. I pray that your pilgrimage, which you have called "A time to walk with Jesus" - can help you grow in love for Christ and for one another. The Lord reserves a special place in his heart for anyone with disabilities, and so does the Successor of St. Peter! I hope that the time you spend in Rome will enrich you spiritually and strengthen your testimony towards the love of God for all your children. You continue your journey, I ask you, please, to remind you to pray for me. May Almighty God bless all of you with abundance! I extend a special welcome to the delegation of the "Special Olympics" organization on the occasion of the 50th anniversary of its foundation. The world of sport offers a particular opportunity for people to grow in mutual understanding and friendship, and I pray that this Olympic Flame can be a sign of joy and hope in the Lord, who grants the gifts of unity and peace to his children . On all those who support the aims of "Special Olympics", I willingly invoke the blessings of joy and peace of God Almighty.